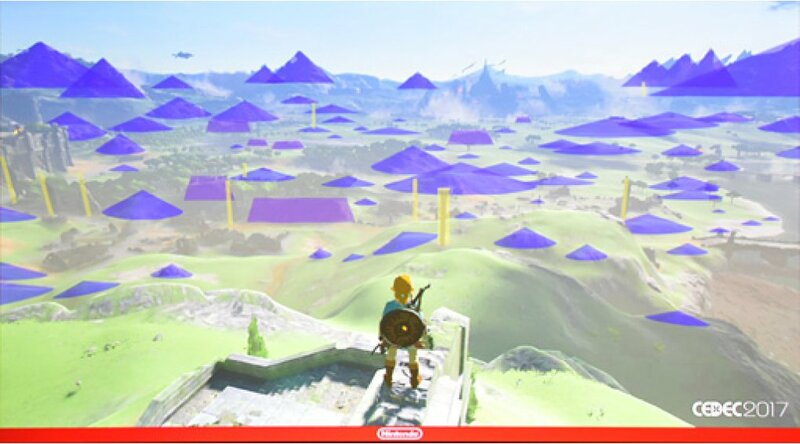 Breath of the Wild had a big problem late in its development: players weren't really enjoying it. They would go from point A to point B, always feeling like they were being guided to do so. When players did diverge from the critical path of objectives, then they would get lost, in a bad way. To visualize this dynamic, the team collected heatmap data to see what players were doing -- and player flow was clearly concentrated on a few discrete paths, as you can see on the left-side of the image above. Why build out an entire open world when players only see a fraction of it? 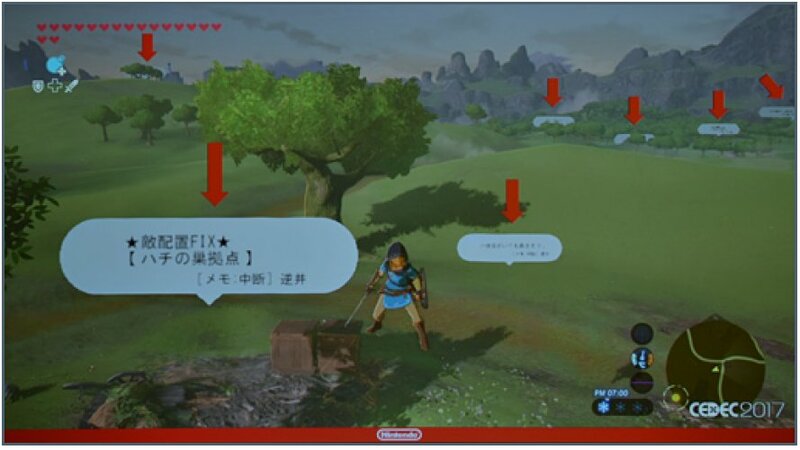 Nintendo's talk is about how they aimed for dispersed player flow instead, to get a more even distribution of player routes, and allow for more individualized traversal. To do so, they agreed on a concept of "gravity." 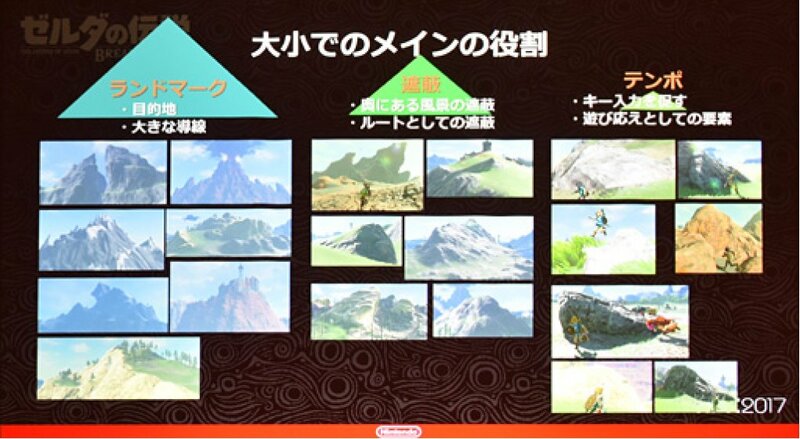 Instead of marking out a specific path somewhere, they would create these sort of bowls / funnels that direct the player to "orbit" around certain landmarks and points. 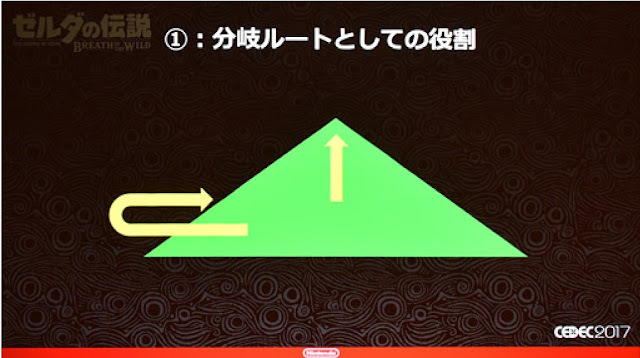 First, there's this idea of a "triangle" or pyramid. It's the basic building block of the game world. They like this shape because there's a peak at the top that you could head towards -- or you could go around the triangle and see what's on the other side. Either way, it is a fundamental shape that funnels movement around it / toward it. You can also partially block other shapes with these triangles to create interesting visual compositions. It is meant to tantalize the player. How do you climb that tower behind that mountain? Well, first you have to get past this mountain, and as you move, you'll be surprised about what's at the foot of the tower... maybe the tower's in the middle of a lake, or it's surrounded by an enemy camp, etc. So even though you knew the tower was there, you're still discovering new things about it. Avoid critical paths that aim straight from one point to another. You should not be able to see entire landmarks from point A to point B. Instead, try to curve and meander your paths so that the player eventually discovers / reveals more of the world as they progress around the bend. There's different sizes of triangles too. Sometimes you want big triangles, visible from outer space. Sometimes you'll want medium-sized triangles, which offer light climbing challenges but still suggest something at the top. Then sometimes you'll want a shallow hill. 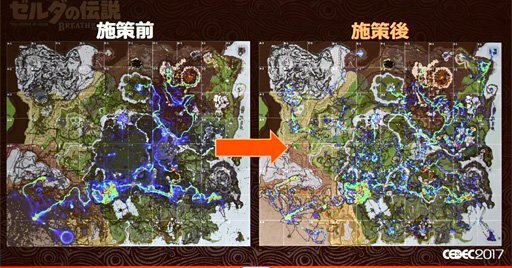 (I'm not sure if they said this, but this is also my interpretation / understanding:) All your main world shapes should fall roughly into one of these three buckets / categories -- clear differences and contrasts between each scale level are important to maintain, you don't want a bunch of muddy shapes that aren't clearly one or the other. A small hill nearby helps make a mountain feel bigger. In practice, they deploy all three scales everywhere, all the time, throughout the entire game world. (1) They visualized notes and task cards inside the game itself, which meant you could all easily get on the same page and helped prevent doubled-up work. I imagine it was also a boon for their QA team as well -- if a tester encountered a problem, they could just mark-up the game world and document the issue right there in the game. 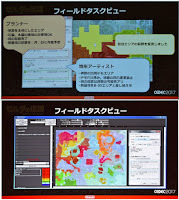 This way, they've sort of decentralized the whole task database as a sort of in-game AR wiki. 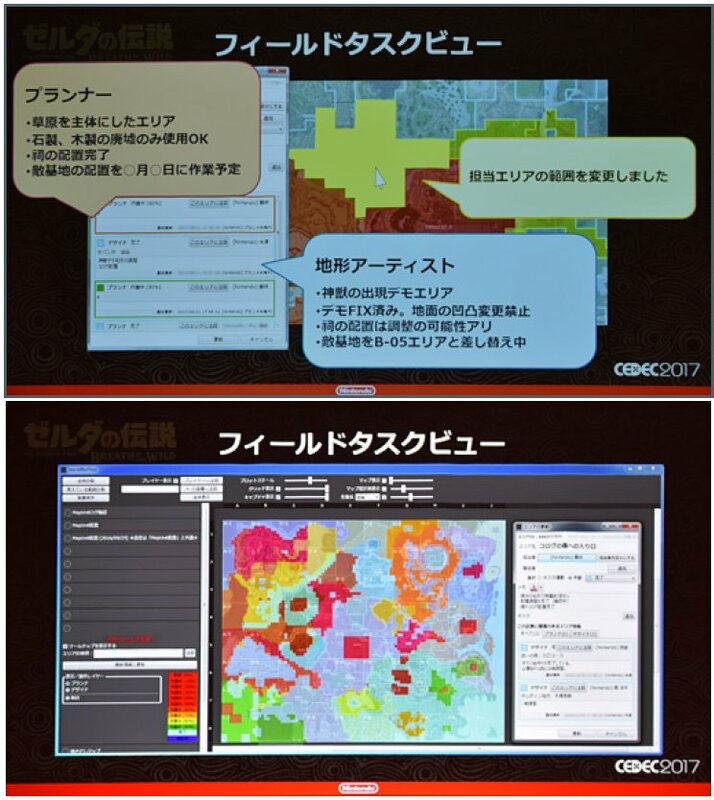 (2) For the cases when you don't want to run around the world to literally hunt for a bug report hidden in a cave, they also built a custom dashboard that helped them visualize the game world and project management. I think it's a great testament to the power of good tools, and the value of investing deeply in tool development. We should probably stop using colossal wikis for coordinating and sharing knowledge within design teams -- that's a last resort for systems that don't have clear spatial metaphors. Meanwhile, in video game land, we're building huge spatial metaphors all the time, so why not use it? It's easier to literally "construct" and annotate that knowledge within the game world itself, as game data. Again, check out Matt Walker's full tweet thread for all the details. I've actually omitted some stuff that I didn't find particularly interesting or helpful, but you might have a different opinion. So, these ideas are really interesting and well-conceptualized, but in level design, this kind of thinking isn't totally new.